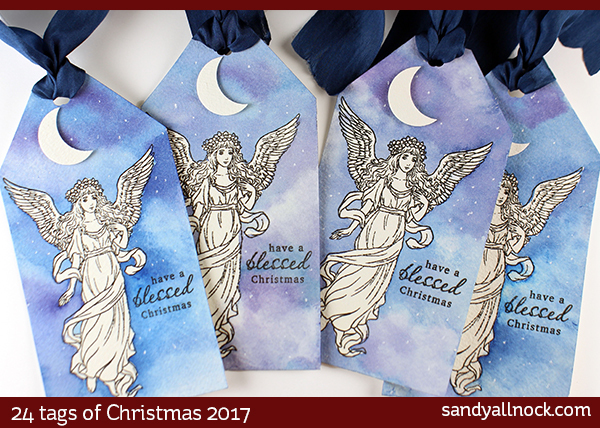 Today’s tags are VERY simple – jus watercoloring the background to look like a starry sky for the beautiful angel to float in! Get some wrapping paper to match and you’ll look like a genius – with just a teensy bit of effort. Watch the video below or click HERE to see it in HD on YouTube. Bible Craft today: Two different advent calendars! All week I’m offering up tutorials on my other channel – and these advent calendars can both easily be adapted to secular themes…enjoy! Watch the video below or click HERE to see it on YT. Love the Heavenly Choir!!! Oh Holy night that’s what this reminds me of! Another great idea…. don’t stress about colouring in! THey are beautiful! Watching the background come together is like magic. Love! Very pretty. Will have to give it a try. Gorgeous! I would not have thought to just do the sky and not the image! You’re so crafty! Thank you! Another winner.. very nice tag. These are gorgeous. I want the stamp set. Thats the danger of watching videos, says the woman with 8 million stamp sets. Lol. You are awesome, sandy. I think I am loving this tag the best and they are all fabulous.